Yet another page designed with My Digital Studio. See details to try My Digital Studio Express Edition free for 30 days later in this post. These are so fast and easy! I do most of my fast pages in 8-1/2 X 11 size so that I can print one or two pages at a time. 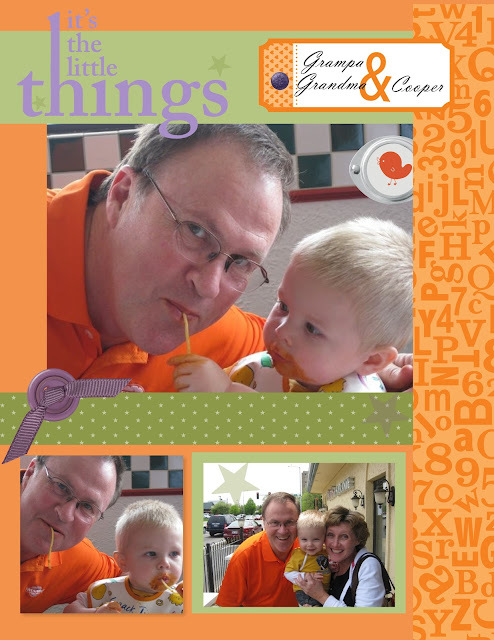 Then when I have enough for an album, I put them together in a photo book and use the professional print services at Stampin' Up! Before I tell you about the retired stamp listing and how to get it, just a few more words about My Digital Studio. You can download a free 30-day trial of My Digital Studio Express. Digital designing is one of the hottest crafting trends right now!. And while mixing traditional stamping with digital designing may not seem intuitive at first, you may be surprised at how easy it to do. The free trial includes the My Digital Studio Express software. This means you'll have full design functionality, access to the Stampin' Up! print services, and the opportunity to purchase My Digital Studio downloads. You'll be able to keep any downloads you purchase during the 30-day trial period for enhancing your My Digital Studio Experss software. To get the free trial version, add My Digital Studio Express (item 129600) to your online shopping cart, and then download and install it. http://www.mydigitalstudio.net/: This website is designed for demonstrators and customers alike. It's the place to go for all things My Digital Studio! On this site you will find training videos, sample projects from other My Digital Studio users, a discussion forum, and the full Stampin' Up! digital catalog along with many other useful My Digital Studio tools. My Digital Studio and My Digital Studio Express video: This video will help you learn the difference between the My Digital Studio and My Digital Studio Express programs. Complete list of My Digital Studio Express downloads: This resource lists all the downloads included in the My Digital Studio Express software. It's a helpful resource to have available when your customers ask what downloads are included in the 30-day trial. My Digital Studio print pricing and specifications: This resource is a great reference not only for print pricing, but also to see the plethora of print products available through My Digital Studio. You'll be excited by all the printing possibilities! Last chance to buy these stamps before they retire! Stampin' Up! announced the stamp sets retiring in just a few weeks when the 2011-2012 catalog retires. Hundreds of stamps and accessories from the current catalog are retiring on May 31, Take a look through the list before you miss getting your favorites before they are gone. Many products are only available while supplies last, so order early! Convention registration started today! Classes filling fast! 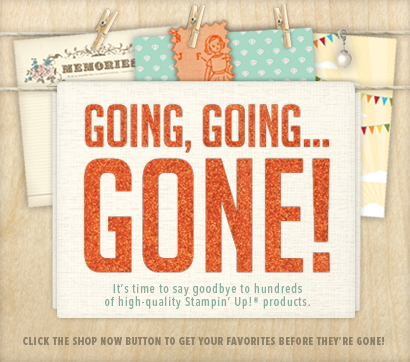 If you're a Stampin' Up! demonstrator, you'll want to join the thousands of demonstrators in Salt Lake City July 18-21 for the annual convention. I just finished signing up and was surprised to see some classes and evening events had waitlists or were already full. Swap groups are also filling fast and I was lucky enough to squeeze into the final slot offered by my favorite swap group. The swap just opened today and is already full and closed! Looks like this year will be a full-house at Convention! Hurry and sign up today! If you're not yet a demonstrator, this is a great time to consider joining Stampin' Up! and purchasing the starter kit. Contact me if you want to learn more. Or learn more and sign up on-line. You can sign up on line at the "Join Now" button!